The Gazzle is in one of Newquay’s most beautiful areas, teeming with coastal wildlife such as seals, seagulls, falcons and cormorants. This is often our preferred route as it’s sheltered from the prevailing south-westerly winds. We enter the water near the old lifeboat house, down what was once the steepest lifeboat slipway in Britain. We work our way around, traversing the cliffs, swimming from coves and looking for places to explore. We also practice jumping from the cliffs starting from a few feet and building up to some higher jumps – the highest being 30 – 35 feet (10 metres) but only if you are happy and confident to give it a go! We start on the south side of Pentire headland with a fun swim along a channel parallel to the headland and then across a small cove before entering a 50m long cave system. It’s a beautiful experience swimming towards the sunshine and out into a deep pool. There are more channels feeding off from the pool. We continue to explore the channels, climbing up to different heights to jump into the crystal-clear water below. We eventually work our way out to the end of the headland for one final jump into the swell below, then head back along the channels, being pushed along by mother nature’s power. It’s a truly amazing experience. This is a very special route and the most fickle! We only take groups here when there is little or no swell, as the highlight is going through the Island’s famous Blowhole. We usually start at Lusty Glaze beach then, swimming out from the beach, we head around the point and through a cave called “Crab Alley” (Don’t worry, we have never actually seen a crab there). As we come out of Crab Alley cave we see the Island in front of us. A small jump and then a swim takes us to the caves on the island itself. 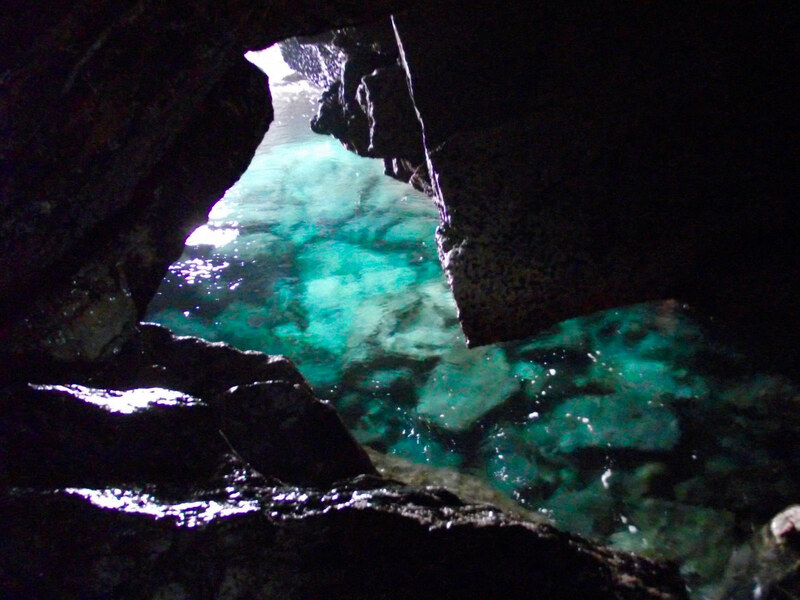 We work our way along until we get to a large crack in the rocks where we pass into the Blowhole and through the blow hole chamber itself before swimming out into the sunlight at the front of the cave. It’s a truly breathtaking experience. We finish off with a range of jumps from small and fun up to large and extra large (if you fancy it). Porth Island is a stunning route – when it’s on.